* Your inspiration for creative gardening, Here you'll find 15 flower garden ideas to help you unify the look and feel of your flower borders. They range from the highly formal specimen plant garden to the more organic themes that many of my visitors prefer. First, don't miss my essential guidelines on flower garden design. You'll also find more links in the side panels here to related topics ranging from container gardening to winter gardening. Would you describe your garden as formal or informal, or somewhere in the middle? This is an important characteristic to help you unify your garden's style. Remember, it is important to maintain a consistent style within each border, if not over your whole garden. Then, you can also create contrast between borders to good affect. Arches to blend formal into informal. A modern garden trend is to grow fine attractive horticultural specimens to their fullest potential. These flower borders show off individual plants to perfection. 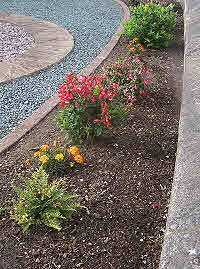 Neatly pruned solitary shrubs and specimen perennial plants are surrounded by relatively large spaces that are covered in aggregate such as slate chipping. There are similarities with container gardening and your plants can look lonely. Stones are usually underlain by sheeting, but this makes feeding your plants more difficult. In affect your garden becomes somewhat dead and sterile. Birds cannot scratch the surface and earth worms will be totally buried or absent. Your plants are clearly more vulnerable to pest attack, and you'll probably want to use chemical sprays. While the specimen garden may be attractive when your chosen plants are in flower, at other times of year there may be little to admire. 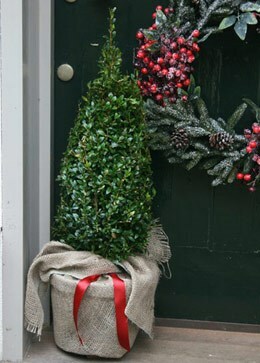 Include variagated evergreens to help out, but the overall impression can lack continuity. Formal flower garden ideas are well made for the entrance to a property. 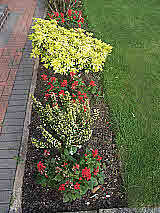 Regular planting, neat lines, bright colors and high contrast - send a strong message to onlookers. Your flowers become a sign-post, to point visitors to your home, and make a statement about ownership. Formal and decorative flower gardening requires regular upkeep. Anything out of place will clearly be a spoiler. You will also need to enrich your soil with organic fertilizers and compost to grow large high quality blooms. What messages do your flowers send to their admirers? Pansy flowers seem to have an expression - but this can be happy, welcoming or cheeky. Winter pansies brighten up dark days, and they might even be seen as tiny cheer leaders. And for small plants, mixed pansies have loud colors - but they do need to be planted in sufficient numbers. Even the natural look of my favourite Pansy x wittrockiana 'rippling waters' is lost when it is lonely. Pansies also look good in hanging baskets and pyramids. Tip: use extra large plug plants. African Marigolds with dozens of uniform double flowers they are just right for a display garden. Their frilly, full flower heads come in rich shades of gold, bronze, and orange. You can get compact varieties or more impressive medium sized specimens. They are spectacular en-mass. Don't forget the single flowered French Marigolds for organic gardens - varieties often display in 2 colors. Dahlias blend beautifully with marigolds and really show some class. You can plant larger areas with 3 to 4 foot specimen dahlias. Many compact varieties are also available. Some of the most striking Dahlias have bright flowers set against dark leaves see photo above right. They are highly admirable flowering plants. Tulips are aloof and stately, standing to attention like soldiers. Grow the Darwin Hybrids or Single Hybrid Tulips for a formal garden. Use the frilly, multi-stemmed, wild, or botanical varieties for a decorative garden. Plain leaved varieties are more formal than the stripy leaved types, while mixed colors are less formal and more decorative. Coleus and Cockscomb create a picturesque, ornate and colorful combination. Coleus brings the most beautiful, richly coloured and ornate leaves. And Celosia plumosa or 'Cockscomb' is one of the most ornate bedding flowers. Their precise and complex patterns grace formal gardens while at the same time suggesting something more natural. But remember, to get the best effect as always, you need to plant in sufficient numbers. Shrubs, topiary and pyramids. A formal flower garden also benefits from tightly pruned fine leaved shrubs (topiary), as well as hanging baskets, rectangular containers and pyramids. The shrubs maintain the flower garden structure in all seasons. What is the unifying look and feel of formal flower borders? It is actually the symmetrical, artificial design, with high contrast, and crisp edges. 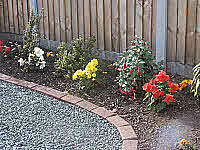 Choose annuals or perennials with regular forms, and bright colours, and shrubs that can be trimmed into neat shapes. Avoid sprawling forms, and plants that grow through drab phases, such as excessive leaf fall. Remember: repeat planting makes an important contribution to harmonise and emphasise your garden style. e.g. see next flower garden ideas. But if you have a favourite plant or one that embodies a look and feel that you like, then you could major on varieties of that plant alone. From just one type of plant to several closely related family members you will create a strong impression as these similar looking plants are repeated. Asteraceae: the star shaped flowers are available in a wide range of sizes and decorative flower colors. You could repeat plant your favourites and use plants of intermediate appearance for a gradual change from one kind of star flower to another. Roses: for some gardeners the quality of a rose defines a beauty that can't be bettered. There are several different types available, including: miniatures, shrub roses - hybrid teas and multi-flora - pyramid roses and standards - climbing roses and rambling roses. However, a typical rose garden looks rather empty. 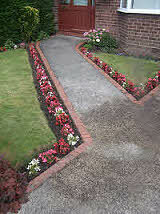 Curved flower borders can be used to transition from a formal design to less formal gardening. They range from the highly symmetrical designs that combine with arches and round houses, to curves that lead the eye into surprising spaces. The nature of curves demands plants with rounded shapes: - globe flower heads and berries, rounded leaves, clump and mound formers, and arching stems etc... There you have a theme to help you select the structural plants that will shape your garden. Curved ponds, arches and gazebos will also fit this theme. 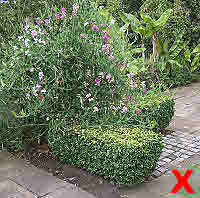 Round containers or bowls rarely fit in well, except in a curved garden. Wide open branching shrubs such as Magnolia as well as standard mop-head trees can fit in well. Under planting with Bergenia cordifolia brings large round leaves to the ground layer. Sedum spectabile is another well rounded perennial. Are you looking for suitable plants, trellis work, or garden furniture? See links below to find them in U.K. & America. Flower borders that run along a boundary are usually narrower to enable the back to be reached from one side only. This restriction can be somewhat reduced by placing paving stones into the border. Nevertheless, with a one-side view only, special planning is needed with regard to plant heights at the front and back of border. Now if you have the choice make this border face south rather than north. Plants such as Sunflowers are included in this selection. They bend toward the sun, and impress everyone as they line up for your show and face their admirers. Sword shaped leaves, vertical flower spikes and column shaped shrubs fit well with straight sided narrow flower beds. 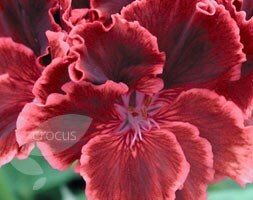 Examples include Iris, Delphinium, Hollyhocks, and grasses... ... The upright ferny leaves of Asparagus are also visually appealing, along with pyramidal conifers such as golden Yew. Low narrow and sunny borders look well when planted with Lavender. You can even choose half a dozen each say, of several varieties, with shades ranging from pink, white and blue, as well as compact, full-grown and the frilly flowered French Lavender. What a show! W h a t f r a g r a n c e t o o ! For low narrow and shady flower borders, even dry borders, Hypericum calycinum is ideal. This forms a low hedge full of bright yellow August blooms with ornate centres and it smothers the weeds. For the back of border you need climbing plants and perennial Clematis (illustrated), climbing roses, passion flower, are just a few specials for a flowering wall. They can be trained to grow over a framework while variagted Ivy is self-clinging and will grow up a wall without support. Sweet Peas and Nasturtiums are lovely annual climbers that will fill any remaining space. Simple-to-fix pyramid structures are available for fragrant roses and sweet peas. You'll appreciate the scent from columns placed alongside your path or use stepping stones to columns placed further back. Non gardening designers feel restricted by using plants. Sadly they resort to manufactured objects to fill valuable growing space - everything from tin cans and drain pipes to pictures of the Mona Lisa. * But real gardeners know better. Their flower garden ideas make use of the huge variety of beautiful plants to create an impressive living garden. There's no reason why one theme can't blend into another - see theme 4 above. Now for the next garden setting Shades of the Stars. These flower garden ideas have more variety than 3 - 'Favourite Plant Family Dominates'. Flat topped flowers such as Yarrow blend well with the stars. Some are especially star shaped, others have colored cones with ray petals, others are doubles with full globe shaped heads. Thistles bring a spiky architectural style to the show. You can create similar patterns with other flower families too. 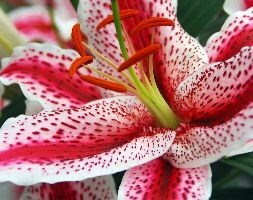 The star shapes on Lily-like flowers develop from a trumpet shaped single flower. 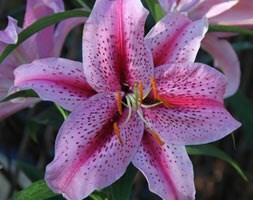 Petals have star-shaped colored markings. Anemone blanda covers the ground in star flowers in spring. Passion flower is a striking ornate flower that climbs summer trellis work. And Winter Jasmine brings delight to walls at Christmas. So star flowers provide connection over the whole gardening year. 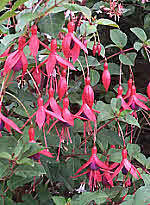 Star flowers come in many colors and shades and at every height for flower borders. Perhaps the biggest challenge is how to position a mass of small stars like Michaelmas Daisies, with large full flowers of Sunflower or Echinacea. When you live life to the full, star flowers are certainly impressive. American gardeners might venture to grow this theme into a flowering flag design. Here's where your beautiful plants simply take over your garden. This theme contains robust impressive perennial plants seemingly crammed together. Flowers jostle for attention, tall arching grassy plumes combine with wide open exotic blooms. The front is packed to the border with bold solid leaf shapes and foamy flowers. Fine detail is hard to capture in photos on the Web. So these pictures don't do justice to the plants. Fine leaved textures are most useful in small spaces. Imagine a low growing smooth carpet of fine textured green in various shades. 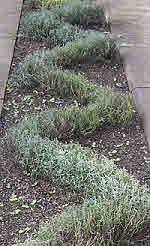 Add to that, low mounds of small leaves, and then small leaved tightly pruned shrubs. You can expect a smooth textured background with a pretty patch work of seasonal flower color in subtle shades. Suitable plants include creeping and scented spreading Thyme Thymus praecox 'Coccineus', and Chamomile ('Treneague') for a scented walk. Add to that the fine leaved shades of Sagina subulata and Scleranthus biflorus and Sedum acre along with their tiny flowers. 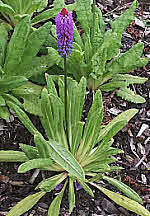 Many of the suitable plants are alpines. Carpet plants are best grown in shallow-pots to make dense cover before planting individuals into a cleared space. This helps to ensure they don't become smothered by competitors. To up the size scale just a touch, consider Delospermum (Ice Plant) and small Sedums... yellow flowered S. kamtschaticum, and red flowered S. spurium, plus the small Saxafrages. Now - still only 3-5 inches high - you have fine leaved low spreading mounds of Phlox subulata, and Rock Rose Helianthemum. Add to that contrasting white / silver colors of Cerastium tomentosum. Blend the fine textured mounds into the carpet. And there are several carpeting shrubs too. Spreading Cotoneasters such as C. horizontalis and dameri provide seasonal flowers and berries. While evergreens from 'Blue Rug' Juniperus horizontalis 'Wiltonii' to Chamaecyparis pisifera 'Sungold' provide fine textured ground hugging shrubs. Consider contrasting shapes and colors too. Low carpets of green will easily accommodate small upright flowers: Crocus, Narcissus, Hyacinths... and dwarf Iris. In damper areas leave space for the larger flat leaves in harlequin colors of Ajuga reptans, and 'organic flowers' such as the spreading Prunella 'freelander mix' or Lamium. Mounds of Polygonum and drifts of Primula viallii add contrasting flower spikes. And small tufted grasses and sedges from the light shades of Blue Festuca Festuca glauca, the yellows of Carex elata 'Aurea' to Black Mondeo Grass Ophiopogon planiscapus 'Nigrescense' can be planted in drifts. Convallaria may also fit in, but rapidly spreading plants are best grown in submerged containers. Keep it small scale. 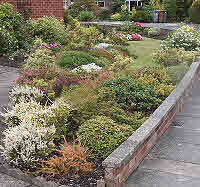 Join the edges to low growing fine leaved shrubs carefully pruned into tight mounds. You might imagine them to be mountains, or a herd of elephants. Most such as dwarf Azaleas and Hebes will produce seasonal flower color too. While the likes of dwarf Berberis will also berry. 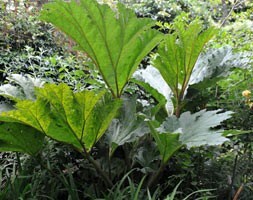 You can also choose bright variegated foliage such as the small Euonymous fortunei. Heathers too are especially valuable for this flower gardening theme. Their foliage comes in many shades from reds, golds, bronzes, and greens and combines with fine textured flowers for all-year color. Although moisture loving ferns are the inspiration here, similar patterns are more widely distributed. 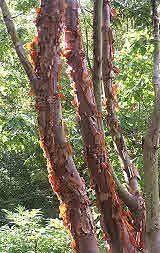 So it can be extended to include conifers, heathers, and plants with divided leaves - such as on Rowan trees. Rambling plants and the ragged and worn shapes of bark, rotting wood and toadstools add another very organic aspect. 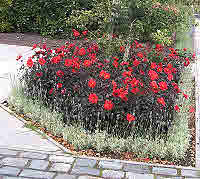 While ground cover plants are desirable, this theme is well set off by bark mulch. Add to this spring, early summer, and fall flower bulbs, plus ground layer plants such as wood anemones. Ferny leaved flowering plants for semi-shade include:- Astilbe, Meadow Sweet and Sanguisorba. For sun:- Yarrow and Anthemis. Flowers with spiky and palmate leaves such as Astrantia, Woodruff, and Eryngium also fit well. Let's not forget the ferns themselves, and with their organic looking fibrous trunks, the tree ferns. 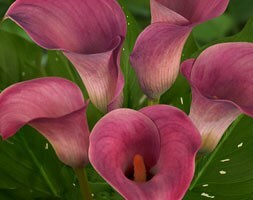 Of course they don't flower and are most associated with damp, semi-shade or full shade. These conditions are useful in organic gardening because they attract friendly wildlife. They can be created in hollows and blended into ponds. Alternatively when you have an open sunny site over shallow, dry, or stony soil, you may find that it won't support lush growth. Your main feature plants could then be grasses, and succulents; perhaps Cacti, Aloes and Sedums. Open shrubs with tiny leaves add to the minimalist affect. The sparse planting in these flower borders approaches the look of a geological landscape and is usually light in colour. The ground cover can be rock scree, shingle or shells. A few large rocks or drift wood may be added. Better still, you might plant low growing fleshy leaved sedums or flower bulbs among the stones. Tiny Sedum Acre will spread to provide carpets of yellow flowers. Mix in Mesembryanthemums and Delospermum to form carpets of pretty star flowers. Add to these alpines like Sempervivum. The threat of global warming has caused some gardeners in temperate climates (e.g. in the U.K.) to move to flower borders in this style. While it is well suited to sunny patios, roof tops, around sunny walls and pavement, please don't dig out well-nurtured soil for this reason. Winter wet and the minimum temperature - below frost in many gardens - remain major problems for dry climate / Mediterranean style flower gardening. You'll find more plants for Winter Gardening and flower garden ideas for your Patio Garden on these links. Some more exciting themes that you could develop in your own garden. The Gnome and Fairy Garden: pure romance, pure magic... you can use ornaments, mirrors, wind chimes, with lights, fairies and garden gnomes, water and wood carvings of mushrooms, toadstools and animals to make a totally magical effect in your garden. And that's just for starters... I haven't yet described architectural plants like Japanese Azalea, and ornamental Acers. Indeed they may fit around the two flower garden ideas 9 & 10 above. But later you'll find more on the beauty of shrub gardening on this link. Maintain open clear lines and keep it relatively simple. Gardeners with Script Disabled - this link won't remember your selection in flowers & plants.